Please keep in mind that if you have selected a pretty long word in the base-word attack, the preparation to the attack may take some time. Later, if the PIN you were looking for is found, the program will notify you of that with the alert you have specified and copy the password to clipboard. 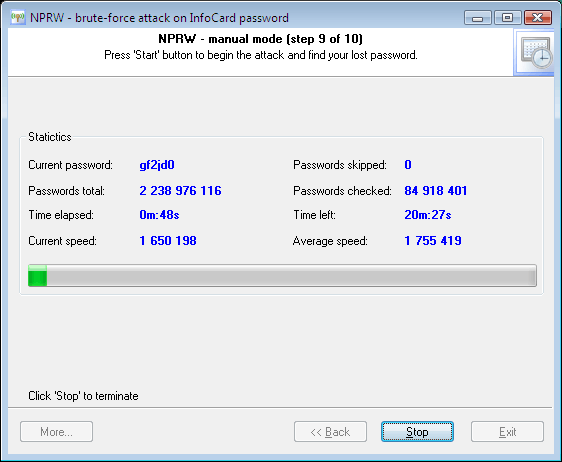 At this moment, the speed of the brute-force attack is ~4 mln. passwords/sec on a modern computer. So, if the luck has shined, and the PIN has been recovered, you can move on to the recovery of private data of the selected InfoCard.